Think England and chances are your first thoughts are of the Queen or the staid palace Guards, not people celebrating garlic, eating nettles, carrying coal or wrestling with their toes. But those are just a few of the charmingly quirky events planned in England this year that ought to make for a very funny family vacation. Held annually on Easter Monday in the village of Gawthorpe in West Yorkshire, the World Coal Carrying Contest is a test of stamina and muscle. 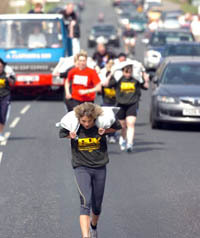 The race involves men carrying 50 kilograms (110 pounds) of coal over an uphill course close to a mile long, while the ladies race sees ladies carry 20 kilograms (44 pounds) of coal. The World Coal Carrying Contest dates back to 1963 when a local coal merchant and the president of the Maypole Committee were enjoying a pint of beer together. A friend is said to have burst into the pub and bet that he could race the two with a bag of coal on their backs. Not wanting to let a good idea go to waste, the secretary of the Maypole Committee who was listening to the challenge, decided to set the race for Easter Monday. Quintessentially British and rather eccentric, asparagus-mania hits the rural market town of Evesham every year, celebrating the start of the English Asparagus Season. The festival kicks off with the Great Asparagus Run involving Morgan Cars, Royal Worcester plates and the finest ‘100 round’ of Vale Asparagus. There is also an Asparabus tour, complete with an Asparaguide to highlight the area and to provide an entertaining insight into this majestic green vegetable, as well as an asparagus family – known as Aspara Gus and baby Gus. 2009 saw the introduction of an asparagus reader who tells visitor’s fortune by looking at the vegetables spears. The concluding event, Asparagus Festival Day, is a fun day out for all the family featuring mouth watering cookery demonstrations, asparagus-oriented meals and tastings, a farmers market, local arts and crafts, children’s activities and local ales, ciders and wines. alk. The competition stems from a contest between two farmers in the mid-1980s to decide who had the longest stinging nettles, after which a longest nettle night was established. One day, an eager contestant named Alex Williams brought in a nettle over 15-foot long and said if anyone had a longer nettle he would eat his. His nettles were subsequently beaten and he duly ate them giving rise to the annual nettle-eating contest. Today people travel internationally to watch or take part. First held over 30 years ago, the Bentley Brook Inn pub in Derbyshire hosts the World Toe Wrestling Championships, now a charity event. The feast of foot foolery sees contestants wearing wrestling outfits sit opposite each other on the Toedium and, locking their big toes together, place their feet on a small wooden frame, termed the Toesrack. At the cry of “Toedown” contestants attempt to force their opponent’s foot to the ground. The organizers, having big intentions for the sport, applied in 1997 for its inclusion in the Olympic Games. To the disappointment of the sport’s fans, however, it was not accepted. Ready, Steady, Slow! For more than 25 years, the World Snail Racing Championships have been held in Norfolk , where more than 300 snails slug it out for the title of ‘Fastest Snail in the World.’ Anyone with a snail can enter and a number of heats are held before the grand final. The winner receives a silver tankard stuffed with lettuce. The world record is held by a snail called Archie who completed the 13-inch course (set up on top of a table) in two minutes. Known to be the oldest rowing race in the world, Doggett’s Coat and Badge Race, devised by comic actor Thomas Doggett, first took place in 1715 to celebrate the coronation of George I. Held in London, the course covers just over four and three quarter miles (7.24 km) along the River Thames from London Bridge to Chelsea. The boats are crewed by watermen who have recently completed their apprenticeships competing for a coveted scarlet uniform silver arm badge that can be worn on all formal and official occasions and is reminiscent of the livery used by early 18th century watermen. The race is watched by crowds of people on London’s bridges as well as from boats moored along the route, while some 15-20 boats also follow the race down the Thames . Garlic ice cream, jelly beans, fudge and beer are just some of the unusual garlic-based produce that can be sampled at the Isle of Wight Garlic Festival. The Garlic Marquee showcases the Isle of Wight ’s ‘Golden Clove’ including the popular oak-smoked variety. There are more than 250 stalls and many tempting garlic-flavored products for visitors to try including banana and garlic, and rhubarb and garlic pickles and chutneys, garlic mussels and other seafood, sausages and bread. The festival attracts 25,000 people and is a two-day event to celebrate the local garlic harvest. Held at the Bridge Inn in Cumbria, the World’s Biggest Liar Competition is a very popular contest to find the best ‘tall-storyteller’ and to award the title of ‘The Biggest Liar in the World.’ The ever-popular contest began in 1974 and continues to attract visitors from around the globe. Contestants travel great distances to pit their oral skills against an elite field of fibbers. Contestants must tell their five- to 10-minute tall tales in front of the judges and the audience. Subjects vary from those based in reality to those that are extremely silly and downright daft. In recent years the audience has learned facts about how the Lake District was formed – not from the ice age or volcanic action, but by large moles and eels. There are also tales of mermaids and kings and of the Pope water-skiing on the back of the QEII. The event is held in memory of Will Ritson, a Cumbrian publican in the 19th century with a gift for telling tall stories. On New Year’s Eve in Northumberland from 11:30 p.m. to midnight, the custom, dating back to 1819, of men welcoming in the New Year by carrying pans of blazing tar on their heads is still kept alive. The unique Pagan ceremony is held at midnight with a colorful procession through the town to the Baal fire. A team of local barrel carriers dressed in fancy costumes, balance flaming whiskey barrels filled with hot tar on their heads through the streets to the town centre. The barrels often weigh as much as 30lbs (15kg). The procession is timed to reach an unlit bonfire shortly before midnight, after which each man in turn tosses his flaming ‘headgear’ on to the bonfire, setting it ablaze. On the stroke of midnight, all join hands and dance around the fire, singing the traditional song Auld Lang Syne to welcome in the New Year.